The road to LOTUS symbolizes our spiritual journey. As we turn onto LOTUS road and pass under the first archway, it symbolizes moving toward something sacred. In America, cars drive on the right side of the road. However, Swami Satchidananda (founder of LOTUS) changed the flow of traffic on LOTUS road. We enter the road on the left side. Why? Because we are asked to leave behind our standard way of thinking, our habitual ways, and open to new ways of thinking. This represents the pilgrimage we are making. As we drive along, on this unfamiliar side of the road, we come upon an unexpected and breathtaking experience of the first view of the Shrine. That is how spiritual revelations are: You are in the darkness, and then you see things you never thought you would see; you are elevated to a different place. This experience sets the tone for the holy ground we are about to enter. The journey getting to LOTUS is part of that. Arriving at the gopuram (the gateway to the temple), immediately we see that everything is symmetrical. Symmetry gives us a sense of comfort and guides us inward to meditation. At the top of the Grand Archway are the All Faiths Yantra and the symbols of all the faiths contained within LOTUS. Thus, the Archway also becomes a symbol of LOTUS and designates the sacred entrance. We are given all the information we need for the world to live together peacefully: Truth is one, paths are many. The Yantra and the multifaith symbols are the core of LOTUS, and we will get this same message in a more dramatic way when we enter the Shrine itself. As we walk along the reflecting pond—we begin to reflect on our own lives. We start to turn inward, and we realize we are on holy ground. When we get to the end of the reflecting pond, the two carved granite elephants that greet us are symbols of the earth element and strength and knowledge. The elephant is also an Eastern symbol of the removal of obstacles. Walking behind the waterfall to enter, we are invigorated by the energy of the Shrine and the water—the negative ions and spirit of the water. We are being charged by the water and cleansed by that process. In the All Faiths Hall, the “One World” sculpture offers the message that there are many types of people on the earth and it takes all of us working together to keep the earth in balance. This sculpture is positioned on top of the meditation vault. This underground vault, if opened, reveals a yantra that was embedded in the cement at the time of the foundation-laying ceremony. During this dedication ceremony, sacred waters and sacred earth—brought from all over the world—and gems were placed at the very center of the Shrine’s foundation. Even a piece of moon rock was placed inside, showing that LOTUS is not just sacred for all people on this planet but also for those beyond our planet. Just as in the human body there is the kundalini—the spiritual energy that moves from the base of the spine through the chakras (spiritual centers) to the top of the head, heralding spiritual realization—the energy of LOTUS moves from the base of the foundation to the top spire. The two spiral staircases that wind upward from the ground level to the upper level of the sanctuary represent the ida and pingala, two of the subtle nerve channels. These channels crisscross the sushumna—the third nerve channel that moves up the spinal column. At the points where they intersect, we find the chakras, represented by yantraswithin LOTUS. LOTUS has seven yantras. The structure itself is a yantra and it contains six more yantras from the foundation up to the ceiling of the sanctuary—one above the other, all in line, going through the central core (sushumna). The energy of the Shrine builds from the vault filled with gems, holy water and earth, and it radiates up to the yantra on the cement. This yantra represents the muladhara, the root chakra (earth). It continues up to the stained glass yantra on the ceiling. This yantra that overlooks the “One World” sculpture of our human family, represents the svadhisthana, the second chakra (water). Upstairs, on the sanctuary level of the Shrine is the third yantra (also in line with this central core) which is embedded inside the center altar. This yantrarepresents the manipura chakra, the power center (fire). The fourth yantra is in the form of the center altar that holds the central light. This is the fourth chakra, the anahata or heart center (air). 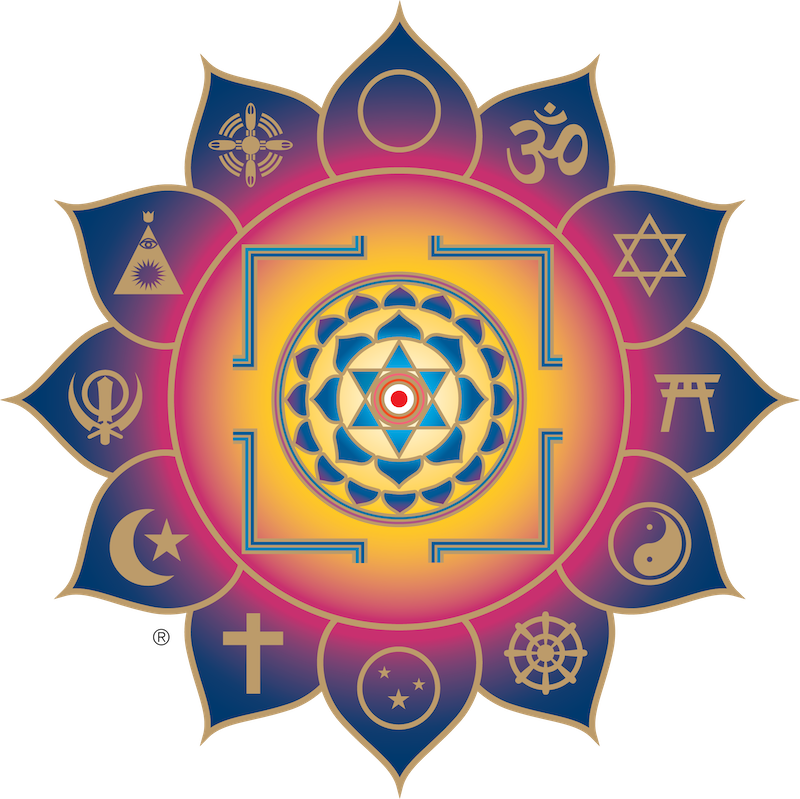 The outer gates of the yantra are open and represent the infinite nature of God’s manifestation; the three gunas(elements of nature) are represented by the circles on the central altar in stone. The black carved granite star holds live flames (fire). The bindu (dot in the center of the yantra) is the central light in the sanctuary. It is moving energy, filled with a liquid containing bubbles that rise to the top of the dome through the air element. This shows us the path our lives should take—if we can move toward higher aspirations, our lives will be more peaceful and, thus, inspiring to others. In the ceiling, we see the fifth yantra: a star. It is shaped from two intersecting triangles (representing the prana and apana or the flow of upward and downward energy). At its center is a bindu, representing the fifth or vishudda chakra, the center of creativity (ether). Above the star, the circular clerestory of windows brings in light representing the sixth chakra the ajna, wisdom center. At the top of the Shrine (above the clerestory) the cupola’s vimanam (cupola with a gold spire) is the seventh or crown chakra, the sahasrara, which serves as an antenna, attracting uplifting energy to the Shrine. The central light, after rising to the top, branches and showers light on the individual altars. The scriptural quotations about light from each faith, make it easy for us to see the similarities in all the faith traditions. Now we realize that, when we stepped into LOTUS, we were walking into a sacred symbol. Inside, the lotus-shaped walls reveal the sixth yantra—we’re actually inside this three-dimensional yantra! We are part of the sacred geometry in a sacred symbol. The whole LOTUS expresses what we should, ideally, cultivate within each of us—that we move upward toward the higher energetics of life where we embrace everyone. During the opening of LOTUS, over 3,000 people, including clergy and spiritual leaders from all faiths, came and charged its “battery.” Through daily meditation inside LOTUS, periodic recharging through special ceremonies, and continual upkeep of the physical plant, the sacred energy of LOTUS is maintained and nurtured. One of the most phenomenal aspects of LOTUS is that its message—“Truth is one, paths are many”—is given to us without one word being said. This message is demonstrated through symbols and the deep experience of peace and unity we feel inside LOTUS. About the author: Bhaskar Alan Deva—one of the primary participants in the building of LOTUS and Yogaville—is now a successful Feng Shui and Vastu Shastra consultant and Yoga teacher. See www.AbundantWellBeing.com.